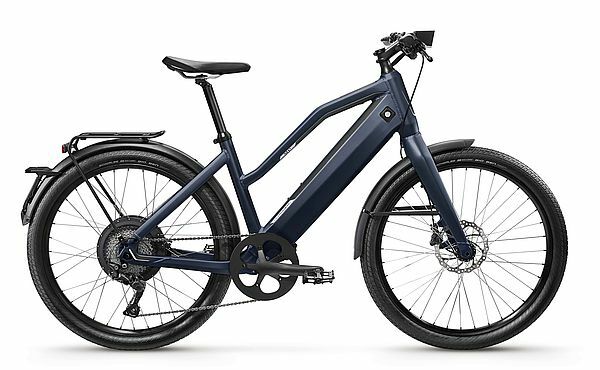 St1 X Comfort Low Step Crossbar | Greenpath Electric Bikes | Electric Bikes For Sale in NYC and Brooklyn, NY. Free Delivery in the US! Step-through design makes for easy mounting and dismounting. Efficient, silent 500W CYRO Drive motor accelerates with potent torque (35Nm) and up to 28 mph of speed. Housed inside the frame, the low-profile lithium-ion battery can be charged in place or easily removed and plugged into a conventional power socket. Handlebar-mounted display places multiple assistance levels at your fingertips, letting you adjust for terrain and decide how much pedaling you want to do. Display also keeps you informed about the battery charge level and distance covered. Regenerative braking recovers energy and feeds it back into the battery. 618Wh battery provides pedal-assist power for up to 75 miles. Low-profile pressure-sensitive color Omni-C touch screen display works even when you're wearing gloves. Remote-controlled Theft Mode automatically locks the bike, flashes its lights and texts you should someone attempt to steal your ST1 X.
Cloud-based Omni app also provides GPS tracking, access to custom ride programs, battery level, service records and more; everything can be accessed via your smartphone.